Being myself…. I spent the first several weeks worrying that I might appear too “American.” I felt that people were staring or looking at me funny if I smiled too much or appeared to be overly enthusiastic, which – if you know me – is pretty normal for me. I have learned this is MY reaction to not feeling completely comfortable in a new environment. Now I just go about my business as I normally would. And guess what?? I’ve been asked many times for directions or assistance – I’m not sure which because I’m always asked in Polish which I don’t understand. Nevertheless, it’s a true testament that I do fit in!! 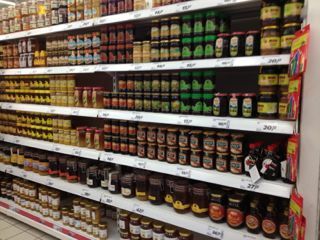 The honey isle in the Real hypermarket. Going out of my way…. 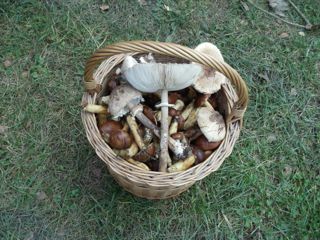 I have found the most amazing things while jogging or speed walking around the city to no particular destination. On one trip, I happily discovered Real hypermarket – a store very similar to a Walmart in the states. The first time I entered it was as if the heavens opened up and the light shone down upon me – hallelujah! Now my only problem is learning to shop without a car – and it’s two bus stops from my flat. I limit my purchases to what I can fit in my little rolling shopping bag. I also found a Brico Depot (similar to a Home Depot) which completely solved my dilemma of where in the heck to buy a light bulb. Meeting new people…. Thanks to the only Fulbright ETA on my campus (Alex), I learned of a Symposium on Human Rights that was being conducted on campus and entirely in English. It’s not really my field so I could have let it pass by, but the topic was interesting AND it was in English, so I decided to attend. What a great decision that was. I got invited to an after hours reception, met the most amazing people, and I have the inklings of an idea for a similar type of exchange with the department I am associated with here. Now I am on the lookout for any other opportunities that increase my exposure to other faculty and events on campus. Thanks again Alex!! Networking…. The student Fulbrighters definitely have their act together. From the very beginning, they communicated and networked through a Facebook account. This is an absolute lifeline for me – it keeps me connected to all the Fulbrighters in Poland – most of them students, but I don’t mind if they don’t mind. At any one time I can log on, and see who’s doing what, who’s going where, and what activities are being planned. As I write this, an event is scheduled in Krakow for Halloween weekend. And guess what?? I’m going to be there!